Hares are again running for their lives this week as Ireland's cruel hare coursing continues. 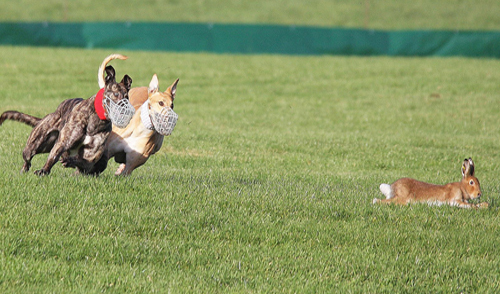 At the Galway & Oranmore, Carlow, Listowel and Nenagh coursing meetings, hares will be used as live bait for greyhounds. Coursers stated that 2 hares "required assistance", 2 injured and 2 declared "unsuitable for coursing" on day 2. Note: Hares "requiring assistance" is a euphemism for hares that have been struck and mauled by greyhounds. Coursers stated that 2 hares "required assistance" 1 certified injured by vet and 1 put down by vet. 7 hares hit by dogs, 2 killed, according to National Parks and Wildlife Service (NPWS) ranger. Coursers stated that 3 hares "required assistance", 1 certified injured and 1 put down because of injuries. 9 hares hit by greyhounds, 1 injured, 3 killed. Ranger noted that "due to the very heavy rain prior to coursing, the field was very wet and the going was heavy and this made it difficult for some hares to get home to the escape." Ranger also noted "1 hare missing". Meanwhile, ICC steward's report noted 12 hares pinned by greyhounds, with 1 put down and 3 dying. Vet noted that 4 hares were injured 1 put down and 3 died. 7 hares hit by greyhounds, 3 killed, 3 injured and 2 put down because of injuries, plus 1 died in coursing compound, a total of 7 fatalities. 4 hares hit by muzzled dogs.